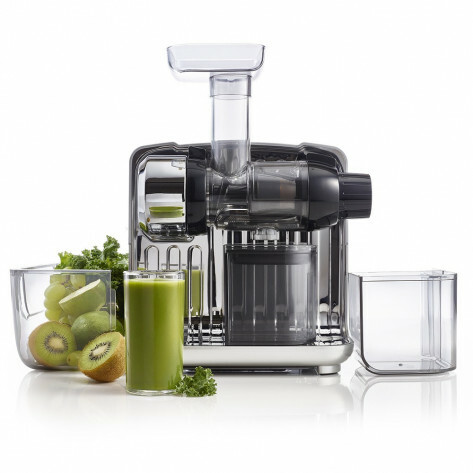 Introducing the latest multifunctional Omega Juice Cube Juicer. Groundbreaking square footprint and cube form factor. The cube ticks all the boxes! Extracts fresh juice from fruits, vegetables and leafy greens! Excellent countertop appeal and compelling industrial design. Convenient storage cavity in the back to store end caps and juice screen or homogenizing cone. Grinds coffee beans and herb Extracts a full taste and high values of vitamins and minerals The Omega Juice Cube chews through plant fibres and penetrates membranes to extract the fullest taste and highest values of vitamins and minerals from foods such as wheatgrass, carrots, and more. Slow juice extraction of just 80 rpms The Juice Cube operates at low speeds of 80 rpms Dual stage masticating extraction The Juice Cube a dual stage masticating extraction for optimum yield. Easy, continuous juicing The Juice Cube automatically ejects pulp into a separate container for easy, continuous juicing.